Never underestimate the love of the parents. It can be so overwhelmingly touching. While dining at a unique well-hidden café at Macpherson, I met Yoon Kay and Jeanne Seah who were owners of Joan Bowen Café. They are also parents to a special needs daughter, but they never gave up on her. Instead, they focused very much on making their daughter’s dreams come true. The café was first set up so that Joan Bo Wen, this young and really passionate girl, can fulfil her dream of being a chef. Not only that, Yoon Kay and Jeanne went on to employ 10 youths with special needs at the café so that they can have a chance to be part of this community as well. Joan Bowen café aims to provide a secure social workplace environment that will help these youths learn and discover their special talents. While my friends and I were having our meal, we could not help notice how happy, positive and confident the special needs youths were. Maybe they needed more time to take orders, maybe they needed reminding. But as long as the customers were patient, you could really feel their passion for living. The food was pretty decent. We really enjoyed the deep fried spice battered Calamari Rings ($9.00) served with homemade tartar sauce such that we ordered two portions. 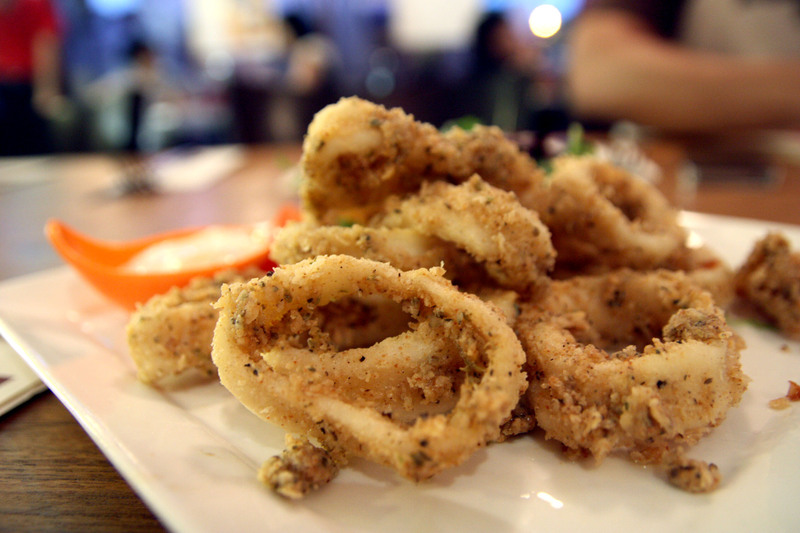 The squid was lightly fried, not too oily and had a fluffy crisp outer layer. The Sesame Chicken Wings ($9) was a crowd-pleaser too. The six pieces of marinated chicken wings sprinkled with sesame seeds, were well-marinated and juicy on the inside, enhanced with a special seasoning on the outside. Other main courses such as the Bangers and Mash ($14), Fish and Chips ($10), Seafood Aglio Olio ($16) and Chili Crab Pasta ($16) were all of reasonable quality. We definitely enjoyed the evening dinner’s not only due to the food, but the casual and homely ambience as well. While talking to Jeanne, it was undeniably how proud she was of her daughter, when she was enthusiastically showing us photos she had taken. This dinner experience made me realise how often we take life for granted, and give up too easily when faced with troubles. Joan Bowen is not just a café, but a place where dreams are built and hopes fulfilled.